Sample-ready to eliminate prep time! 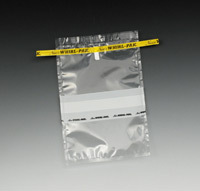 Just tear off perforation at top, pull open with center tabs, insert sample, fold top over, and close double-wire end tabs. Creates airtight, leakproof seal for transporting liquid, solid, or semi-solid specimens. Clear virgin polyethylene. Write-on® style makes labeling easy. Meets FDA and USDA specifications for food contact.